Newsroom Blog What’s the ROI of an idea management platform? Can you put a figure on it? What’s the ROI of an idea management platform? Can you put a figure on it? No matter your team or department, at some point I bet you’ve been asked to provide the return-on-investment (ROI) of a project, tool or process. 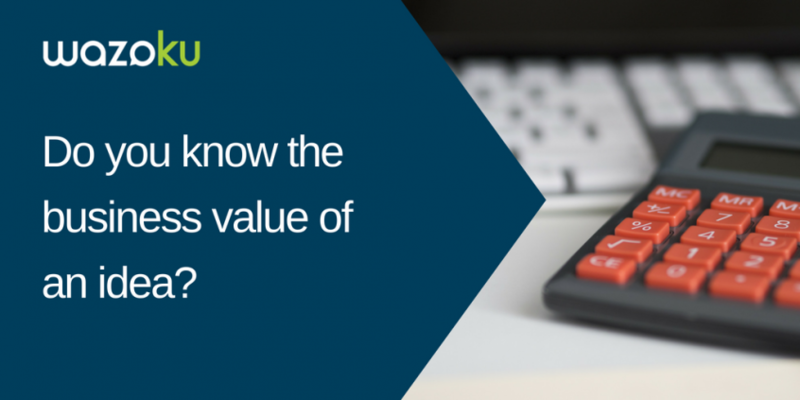 Calculating ROI is a way to show that the money or time invested is worth the value of the return. It’s especially useful when seeking buy-in for a new tool or process and to measure its potential impact. Do you know the business value of implemented ideas? They can be a series of small and incremental ideas, customer-centric ideas designed to improve the customer experience or big and disruptive ideas opening new markets or sectors. Are you currently using a spreadsheet, email inbox, social enterprise network (e.g. Yammer or intranet) or something else to manage ideas within your business? Are you investigating or curious about how an idea management platform will impact your bottom- or top-line? We built a ROI calculator to help you determine the value your business could realise from an idea management platform. It was built by analysing actual customer data from our Idea Spotlight platform; data that was anonymised and aggregated in March 2018 to create a snapshot dataset. We draw on a global set of medium- to large-size companies from different industries and representing typical, but varied, use cases for an idea management system, to most accurately model how user engagement rates vary between internal (desk-based) users and external (field/remote) users. Understanding these potential engagement rates is critical to accurately calculating the anticipated business value of such an investment. Registered address: Wazoku Limited, Unit M19, St Magnus House, 3 Lower Thames Street, London, EC3R 6HD.